This amazing trek of Langtang Ganga La Pass takes you to the north of the Kathmandu Valley and just south of the Tibetan border, in the famous Langtang region. It is one of the adventurous and challenging treks in the isolated Langtang Valley which offers you magnificent beautiful Himalayas views; Langtang and Helambu, old and significant Buddhist Monasteries, Chortens, religious monuments and shrines, Yolmo Heritage Trail, diverse flora and fauna, numerous wildlife such as; Snow leopard, Musk Deer, Black Bear, Tahr, Ghoral, common langur and many more. This Langtang trekking leads us to the Ganja La Pass(5122m), the highest La pass located at a height of 5160m. The way to the Ganja La Pass covered with the beautiful snow so fine gear and mountain climbing skills are required to make a successful secure trail. Ganja La Pass trek follows the beautiful alpine forests, rich flora and fauna and splendid high-altitude pastureland. Langtang is a home place to ethnic people called Sherpa and Tamang. All the Sherpa and Tamang are heavily influenced by the Tibetan culture as they follow religious practices, speak the language and the dress they wear are almost similar to Tibet. This trek will also provide you great opportunity to be familiar with unique Tibetan culture and traditions. Ganja La Pass trekking begins from Sybrubesi, ascending up through the away from the river along with lush rhododendron and bamboo forests to Kyangin Gompa. Kyangin Gompa is a famous place for magnificent snow-capped peaks and Buddhist Monasteries. As you cross the Ganja La Pass, you will find them quite challenging trail, where you need some technical equipment along with the experienced guide. We will also pass some wilderness and reach to the Sherpa Village called Tarke Ghyang by following beautiful rice terraces, and ancient Buddhist monasteries. By exploring the village of Sermathang and Malemchi Puul Bazaar, you will end your Langtang Ganga La Pass trek. 10.Visit UNESCO World Heritage Sites such as; Hanuman Dhoka Square, Pashupatinath Temple, Swoyambhunath and Boudhanath Stupa. When you arrive at the Kathmandu Airport, our representative will welcome you and he/she will drop you at the hotel so that you can relax and take rest in the hotel. The next day, we’ll manage for you to visit some religious and historical places in Kathmandu Valley. We will begin our sightseeing tour in Kathmandu, observing the UNESCO World Heritage Sites such as; Hanuman Dhoka Square, Pashupatinath Temple, and Swoyambhunath and so on. Boudhanath Stupa and Pashupatinath which are the most famous place in Kathmandu. Pashupatinath Temple is the most sacred site for Hindus that is situated on the bank of Bagmati River and is known as the principal temple of Lord Shiva. Soyambhunath Temple is also known as the Monkey Temple that owns a large number of monkey populations in the area. In the evening, our representative will provide you a brief explanation class about the further trek and take time to be prepared for the next morning trek. Overnight in the same hotel. The Langtang Gosaikunda treks begin from the Kathmandu to Syabrubesi. You need to drive around 7 to 8 hours to reach Syabrubesi, which is situated at the altitude of 1,460m. The drive passes through winding route that goes uphill and downhill. On the way, you will see some rural towns and farm villages and finally, you will reach a large town called Trisuli Bazaar, which lies in the subtropical climatic zone. Then you will continue your trek toward uphill through the rice paddy field, maize, and millet terraced field until you will reach Dhunche. In Dhunche, you will be encounter in the headquarters of the Langtang National Park Office, The Royal Nepalese Army will check trekking and Park permits as well as serve as the Park Warden. From here, you will continue your trekking toward downhill. It takes around 1 to 2 hours to reach Syabrubesi Village. We’ll stay overnight at Syabrubesi Camp. In this day, after early breakfast, we head towards Mundu through the Langtang Village. We will steady ascend by following the dense forest. On the way, you will have a marvelous view of Langtang Lirung and the further trail will lead us to the Munda village. Overnight at Mundu. Day 5 : Trek to Kyangjin Gompa (3,870m/12,697ft): 3 hrs. Explore the area. 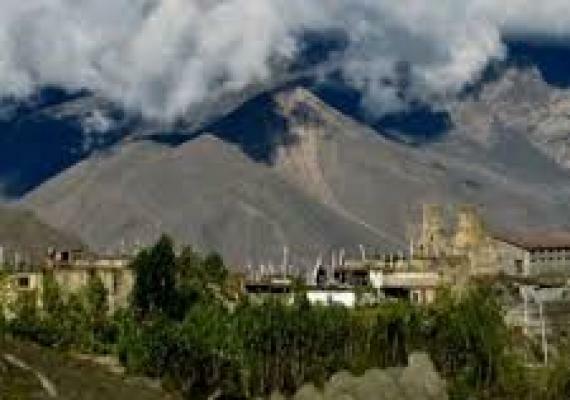 Next morning, after breakfast, we will start our trail towards to Kyangjin Gompa, a principal monastery of the region. During your trail, you will cross water mills, wheels, prayer chortens, with sacred mounds of rocks with inscriptions carved. Beside this, you will also pass the largest Mani wall in Nepal, made from stone with prayers written on them. After the pleasant further short trek, let you explore the Buddhist shrine and its surrounding areas with the amazing views of the mountains. Overnight at Kyanjin Gompa. Day 6 : Explore Tserko Ri (5000m/16,404ft) 7-8 hrs. In this day, after breakfast, we will begin our trail towards Tserko Ri, which is situated at the elevation of 5000m. Today, you need to walk through the Yak pastures in the high altitude and reach to Tserko Ri. Tserko Ri is famous for the stunning mountains sunrise views. Stay overnight at Tserko Ri. 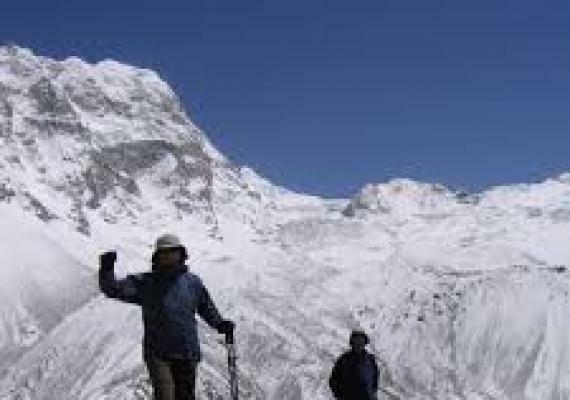 Today, after morning breakfast, we will head towards Ganja La Phedi, which is situated at the altitude of 4300m. the way to Ganja La Phedi, we will cross the Langtang River and ascend through beautiful rhododendron forests. Further ascend will take us to our destination. From the Ganja La Phedi, we can have a panoramic view of the surrounding. Overnight at Ganja la Phedi. Next morning, we will continue our trail and cross the one of the difficult and challenging Ganja La Pass. This pass is so tough because it is covered with the snow almost the around the year. Today, we need to make long ascend by following boulders, small lakes, and summit of Ganga La with the spectacular mountain views from the Pass. As we reach and explore Gangala Pass, we will descend down to Keldang, at the summit of 4250m from the sea level. Overnight at Kedang. In this day, after early breakfast, we begin our trail towards Yak Kharka. Around 5 to 6 hours, we need to descend down by following the beautiful forests, ridges, and grasslands. Finally, we will reach to the Yak Kharka at the elevation of 4000m. and stay overnight at Yak Kharka. In this day, after breakfast, we will descend gradually and lose the altitude around 1500m and reach to Tarke Gyang, at the altitude of 2590m. Overnight at Tarke Gyang. Next morning, after breakfast, we continue our trail through a small forest and beautiful village of Helambu region. The further trail will be through the wide valley following, Parachin, and Sherpa. There you will get chances to practices Drukpa Kagyu Buddhism. Finally, you will reach to Sermathang. Overnight at Sermathang. Today is your final day of Langtang Gangala Pass Trek. You will continue your trail down towards Malemchi Pul Bazaar. The way to Melamchi, you will encounter many Sherpa village. As you reach to the Malemchi Pul Bazaar, you will return back to Kathmandu with tourist Ac Bus. Around 2 hours scenic drive take you to the capital city of Nepal. Overnight in Kathmandu. Today, you will be back to your home. Our representative will help you to find your final destination. We will hope that you will be ready for the next adventure in Nepal.